The heart works around the clock, pumping to keep blood flowing throughout the body. A strong and healthy heart is vital for enjoying a high quality of life as you age. 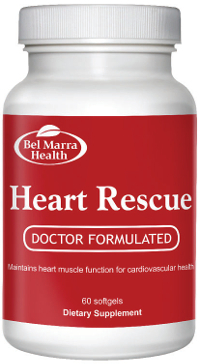 Heart Rescue was designed to help support and promote cardiovascular health, using a variety of ingredients, including omega-3 fatty acids, CoQ10, magnesium, and hawthorn extract. The omega-3 fatty acids in Heart Rescue are EPA (eicosapentaenoic acid) and DHA (docosahexaenoic acid), two omega-3 essential fatty acids that play an important role in maintaining cardiovascular function. Many studies have demonstrated the benefits of omega-3s for heart health. CoQ10 also plays an essential role in the Heart Rescue formula. It is involved in energy production at the cellular level, helping produce ATP. ATP is used by heart muscles as fuel to help keep the heart beating strong. These two heart health superstars are supported by 5 other ingredients to promote and support cardiovascular function as you age. DIRECTIONS Adults take 2 softgels daily or as directed by a health care practitioner. Do not use if seal around cap is broken. WARNINGS Consult a health care practitioner prior to use if you are taking cardiacglycosides such as digitalis/digoxin, blood thinners or blood pressure medication. Consult a health care practitioner if symptoms persist or worsen.